Modern fashion industry actively restores long sleeve dresses into female wardrobes. Such dresses are suitable for any season, they are also practical and convenient. To whom may they fit? The long sleeve dresses suit to any body type. They not only emphasize the slender figure, but also hide the body flaws, you only need to choose the proper model. Such dresses are perfect for women who are not satisfied with their arms. 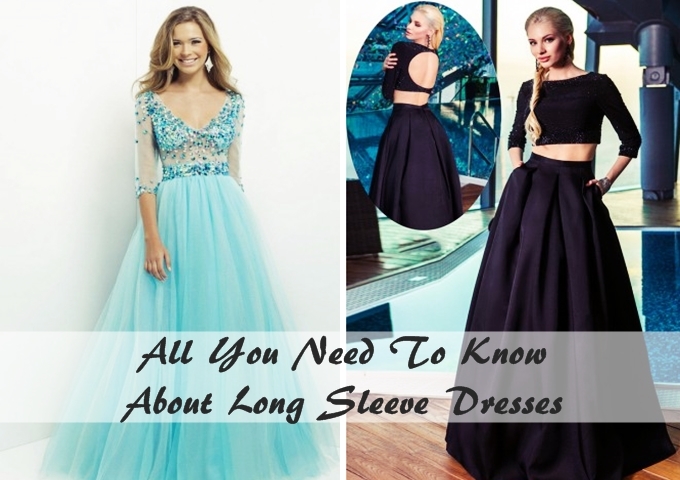 If you feel you have bingo wings, or your arms aren't as toned as you’d like them to be, then a dress with long sleeves could be a perfect match for you. This type of dress will let any woman look more slender and elegant. One more benefit of having such dress is that you don’t have to buy additionally a bolero or a cardigan for it; that means the dress will fit both for a cold winter evening, and for a chill summer night. Long sleeve mini-dresses are very popular among young girls. More often, the back part of such apparels is exposed, what actually delights their owners, while the hands are hidden. A girl wearing such dress looks sensual and romantic. A dress covering one shoulder looks also stylish and gracefully. The length of a dress can vary from mini to maxi. This option is great for attending some parties. A multi-purpose dress has a pretty deep neckline and is made of monochromatic tissue. This style is also suitable for any occasion; you only have to apply proper accessories to it: a handbag and jewelries, fashionable belt and thin studs. A roll-neck dress is regarded a very practical and comfortable model. As a rule, it is supplemented with a V-shape neckline or a stand-up collar. Such dress swifts the body and makes the silhouette look incredibly attractive. A model of a dress with flared sleeves is a real godsend for curvy-shaped women. Such fashions look womanly and can visually correct the body in general. For the evening outfit, the long sleeve dresses should have an original trim and decoration. Flowers, bow-knots and various draperies can add individuality to the apparel. Long sleeve dresses will fit well both for attending some official ceremonies and receptions, and for work, or cinema, or just for a walk with friends. Depending on the fashion, style and color, you can pick up any unusual accessories to the dress, and make your look even more original. This beautiful thing is a must-have in any female wardrobe. It will let any lady create her personal irresistible look.